Now it’s been a little more than 46 years to the day since that first P.E.T. course began. And so much has happened since that day. Like every new idea, P.E.T. attracted a lot of imitators. In addition, people with very different views about how parents should raise their children came on the scene. Today, there are literally hundreds and perhaps thousands of parent training books and courses. Clearly, it’s an idea whose time has come. Now, we know that parent training can have a major impact on how parents raise their children. There is overwhelming evidence that ineffective parenting is the cause of many of the problems that children and adolescents develop and struggle with throughout their lives. And we know that effective parenting can prevent many, if not most of these problems. In fact, it can do much more than that–effective parenting can create family relationships in which both parents and children can thrive. With so many choices, how does a parent choose which model to follow? Each model offers a specific philosophy of child-rearing and some offer skill training as well. 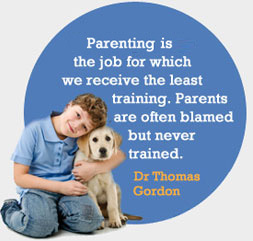 There are several parent training models within which many parent training programs loosely fit. Most of them are based on the work of well-known and respected psychologists who have written books describing their theories. In most cases, their students and/or advocates developed courses for parents based on these theories. Some of the courses advocate that parents be in control (autocratic), though the degree of control varies. Almost none advocate permissiveness. Some, like P.E.T., show parents how to have a collaborative, cooperative relationship with their children (democratic). Book: Parent Effectiveness Training (P.E.T. ), 1970, 2000. Course: Parent Effectiveness Training (P.E.T. ), 1962, 1976, 1989, 2005. This book and course offer a philosophy and set of communication and conflict resolution skills for helping parents develop and maintain a democratic, mutually satisfying relationships with their children and with each other. The conceptual model is the Behavior Window, a framework that Dr. Gordon developed for determining who owns the problem. Parents learn to use this window to help them to decide which skill to use depending on whose problem it is. There is heavy emphasis on learning the communication and conflict resolution skills so they can be used right away, both at home and in all relationships. How to handle values differences through modeling, consulting, I-Messages. This book and course offers a philosophy for having more meaningful, deeper connections with children, other people and oneself. It focuses on needs–one’s own and those of the other person and makes a case for learning to communicate in ways that create harmony and peace between people instead of arguments, misunderstandings and even violence. And it demonstrates the attitudes and skills that are needed to have such relationships both in the family and with others. P.E.T. as compared with N.V.C. N.V.C. and P.E.T. are grounded in the same philosophy. They have quite different ways of presenting their models. Both Thomas Gordon and Marshall Rosenberg were students of Carl Rogers. Course Length: Six sessions, six 30-minute videos or audios. This book and course offer parents empathic listening skills, authentic self-disclosure and problem-solving skills for raising children with high self-esteem and autonomy. It focuses on helping a child view him/herself differently by letting go of old ineffective roles or labels and as a result have freedom to develop and change. Praising children by describing their behavior, not evaluating it. This model is based on the work of Dr. Haim Ginott (a student of Carl Rogers) and has a philosophy with some similarities to P.E.T. This book and course focus on how children grow and behave, on misbehavior and effective ways to deal with it, on the importance of encouraging children and how to do that effectively, on listening to children with empathy and talking to them authentically. It deals with both Natural and Logical Consequences as alternatives to rewards and punishments in disciplining children. (Natural Consequences are those which occur naturally. Logical Consequences are those created by a parent in response to a child’s misbehavior.) It advocates family meetings (to plan for fun, to express feelings, to make decisions, to resolve conflicts). P.E.T. as compared with S.T.E.P. S.T.E.P.’s focus is on why children misbehave and how parents can deal with misbehavior effectively. The S.T.E.P. program offers many of the P.E.T. skills in a shorter version including Problem Ownership, Active Listening, I-Messages, Problem Solving. While both programs are opposed to the use of rewards and punishments as a way of disciplining children, S.T.E.P. advocates the use of Logical Consequences. In the P.E.T. philosophy, Logical Consequences are a form of punishment. S.T.E.P. is a combination of parenting methods based on the work of Alfred Adler/Rudolf Dreikurs and Thomas Gordon. This video-based program is very similar to S.T.E.P., i.e. its foundation is based on the work of Alfred Adler and Rudolf Dreikurs and it includes a major component of P.E.T. ideas and skills in an abbreviated form. The Love and Logic model advocates that parents use their power to get children to obey, i.e., “healthy control”. It is based on the belief that this kind of discipline will teach children responsibility. P.E.T. is a model which advocates that parents not use their power to control their children. Instead, it advocates the use of communication and conflict resolution skills to influence children and empower them to become self-reliant, make positive decisions and control their own behavior. This book and course offers the concept of Constructive Parenting and defines that as a way of raising children to help them become socially and emotionally competent. Parents are in control; they set the rules and enforce them. How to deal with misbehavior is a main focus. The book contains chapters with age-specific advice on how to deal with such behaviors as crying, whining, temper tantrums, disobedience, interrupting, sleeping and bedtime problems, swearing and chores. Taking care of self as a parent, i.e., eating well, getting enough exercise and sleep, etc. The Triple P model advocates the idea that parents exercise control over their children, expect obedience and apply discipline when children misbehave. P.E.T. views the parent/child relationship from a different frame of reference and teaches parents how to have collaborative, cooperative relationships with their children. It teaches a non-power method of raising children and offers skills of empathic listening, honest, clear and non-blameful self-disclosure and conflict resolution skills. This model is based on the idea that parents need to begin teaching respect for authority starting when children are very young. The main job of parents is to teach their children to obey. When they are “defiant” and don’t obey, parents should punish the disobedient child by spanking him/her. After such confrontation in which the parent has demonstrated his/her right to lead, it’s important to explain to the child why s/he was disciplined and to let the child know how much the parent loves him/her. Love and control present in balanced proportions. Dare to Discipline comes from the point of view that the parent/child relationship is a contest of wills and that the parent must always win at all costs. It is imperative that a child be taught to obey. Dobson advocates the use of corporal punishment as the way of dealing with “defiance” and disobedience. This is the only model in this comparison that advocates physical punishment. P.E.T. shows parents how to have a relationship with their children that is based on mutual respect as opposed to obedience. It offers evidence about the harmful effects of punishment on children and on the relationship between parent and child. And it offers communication and conflict resolutions skills that make punishment (and rewards) unnecessary. Steve Biddulph, clinical psychologist and parenting author.